Submitted by Taps Coogan on the 16th of April 2019 to The Sounding Line. The US economy is in the 118th month of the current economic expansion. If it can last until June, just two more months, it will overtake the 1990s expansion to become the longest in American history. Here is a brief look at how the current expansion compares to previous expansions going back to 1954. It is important to note that the comparisons look at peak-to-peak values in order to determine growth beyond levels already seen in the last cycle. The following chart ranks the compounded quarterly growth rate of inflation-adjusted GDP for each economic cycle. The values shown are the compounded quarterly growth rate between each cycle peak and the previous cycle peak. For the current cycle, the most recent data from the end of 2018 was used. 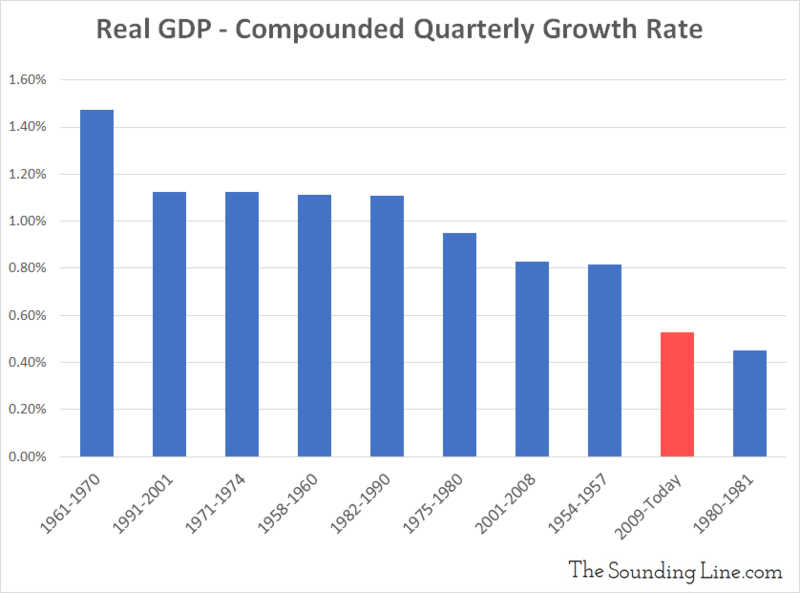 The current cycle has seen the second slowest compounded quarterly GDP growth rate since 1954. The only cycle that was worse lasted just 12 months between 1980 and 1981. At that time, inflation was hitting its highest levels on record at over 13%. The current cycle has seen the economy grow 35% slower than during the 2001 to 2008 expansion and less than half as fast as during the 1990s expansion. 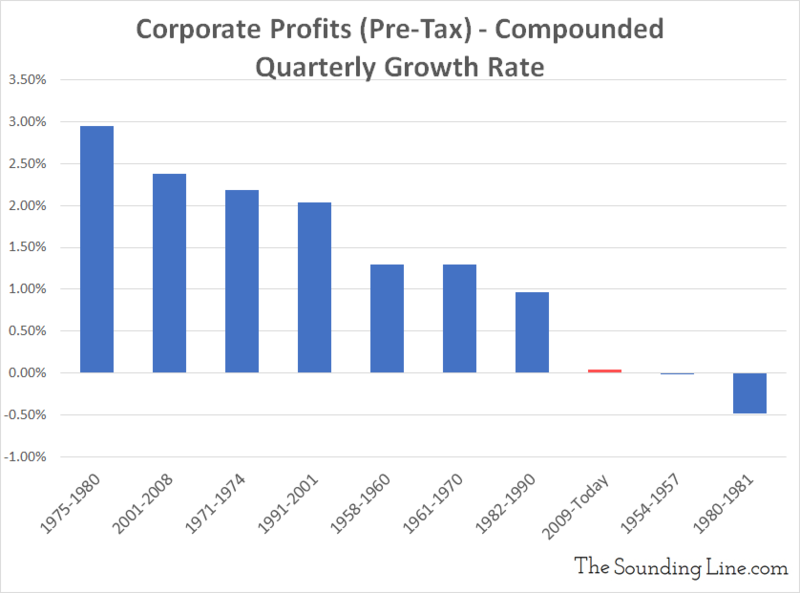 The following chart ranks the compounded quarterly growth rate of pre-tax corporate profits for each economic cycle. The values shown are the growth rate between each cycle peak and the previous cycle peak in corporate profits. For the current cycle, the most recent data from the first quarter of 2018 was used. The current cycle has seen the third slowest pace of pre-tax corporate profit growth, just 0.04% per quarter, compared the 2007 levels. Once again, the brief 1980 to 1981 expansion was the worst, followed by the 1954 to 1957 expansion. Pre-tax corporate earnings have barely recovered to their 2007 highs. 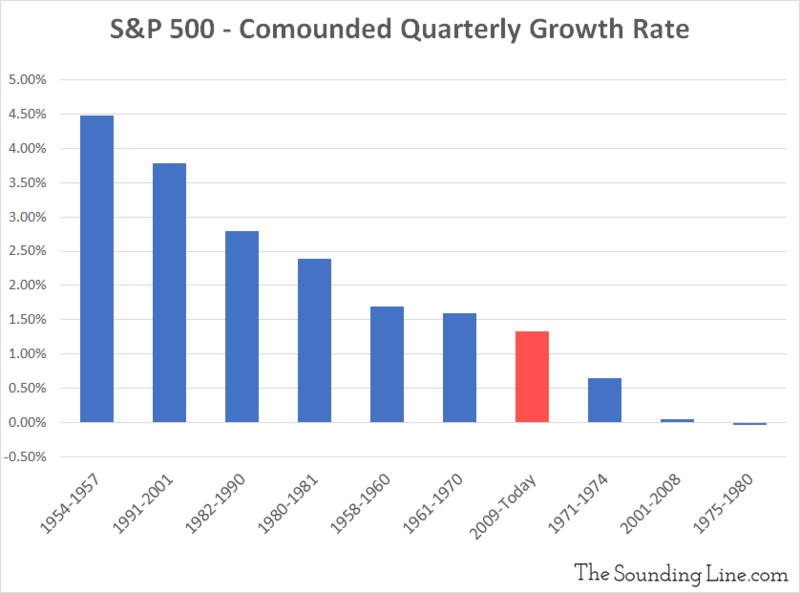 The following chart ranks the compounded quarterly growth rate of the S&P 500 index for each economic cycle. The values shown are the compounded quarterly growth rate between each cycle peak and the previous cycle peak. For the current cycle, data from the market close on April 12th, 2019 was used. Perhaps most surprisingly, the current expansion has seen the fourth slowest quarterly S&P 500 growth. There is a widely held perception that US stock indices have experienced an anomalously strong bull market since the Financial Crisis. In actuality, the market appreciated faster, relative to its last peak, in six of the last ten economic cycles. Furthermore, the market appreciated almost three times faster during the 1990s expansion, which lasted longer than the current expansion. Of course, when one considers that pre-tax corporate profits have barely grown at all since 2007, and that real GDP has grown very slowly, the growth rate in the S&P 500 is indeed quite aggressive. The S&P 500 has grown 42 times faster than corporate profits in the current cycle, compared to near parity during the 2001-2008 expansion, and three times faster during the 1990s expansion. It is important to remember that these charts are calculated using peak to peak values and, in the case of the current expansion, most recent data to past peak values. Part of what makes the performance of the S&P 500 during this expansion, and the 2001-2008 expansion, look so poor is the depth of the selloffs that had to be recovered to simply get back to the previous peak, peaks which were themselves quite elevated. Despite the most accommodative monetary policy in modern history, the current expansion has been among the weakest in post-war history. All of which begs the question of just how helpful perpetual ultra-accommodative monetary policy has really been.